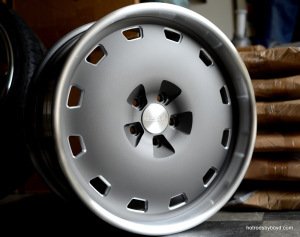 From the HRBB Gotcha Series comes the 5 lug Chinook shown here in our combination brushed and Cerakote charcoal finish. 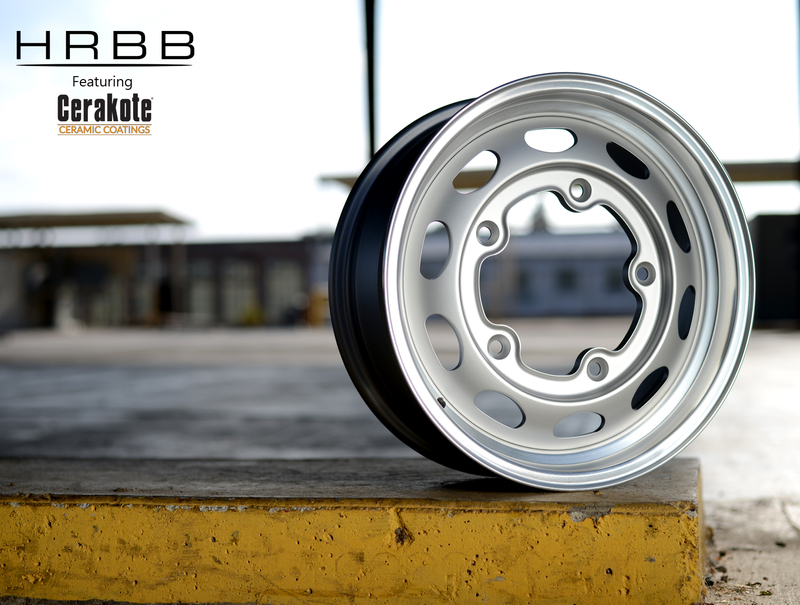 HRBB builds the Chinook to order for 5 and 6 lug in diameters 17 through 24″ and widths from 7″ to 15″ standard. Fully polished, fully painted, or a combination of the two HRBB can build them to fit your needs. Just like the rest of the forged HRBB products the Chinook is 100% made in the USA. For more information call 866-612-2693. HRBB builds not just some of the finest hot rod and custom wheels on the planet but we offer a wide range of early Porsche designs and applications as well. Shown here is our 16″ Model A wheel coated with silver Cerakote on the center and then Cerakote matte clear over a polished lip to give the rim shell an old school anodized look. 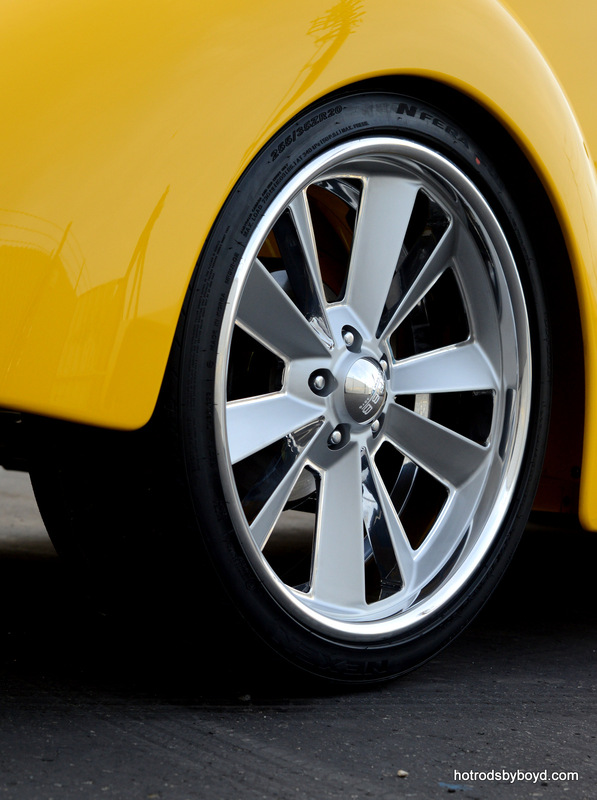 We build wheels for early drum and disc brake 356 Porsche fitments as well as early and late model 911 fitments. Everything is made to order and 100% made in the USA. Hot Rods by Boyd and Chris Coddington are bringing back some of the iconic billet wheels that started the billet wheel revolution in the 80’s and 90’s. Shown here is the HRBB Retro Series Speedstar in 18″ and full polished finish. 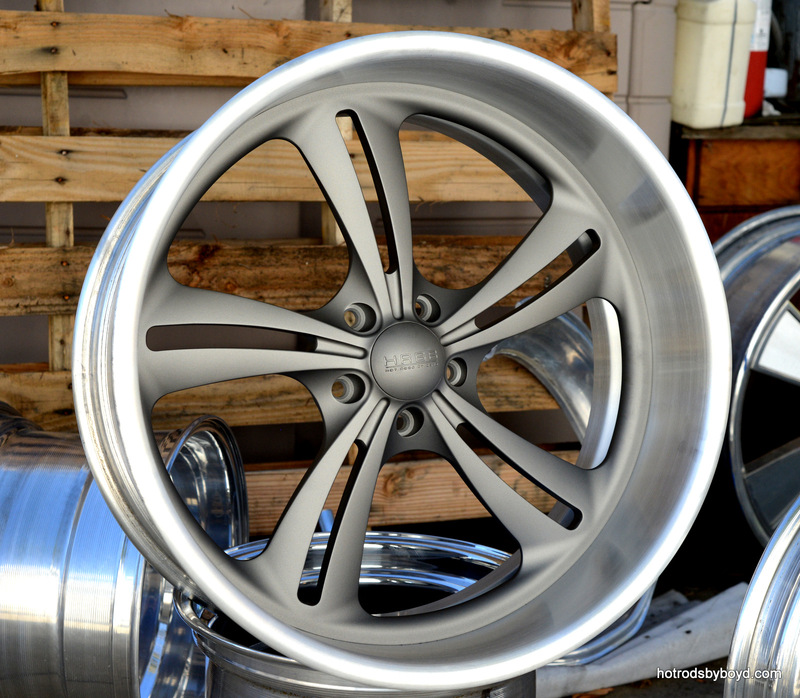 HRBB is willing to recreate any of the older iconic billet wheels from back in the day in larger diameters. If you don’t see it just call and ask us because we will most likely build it for you. 714-855-4808. Shown here is a 24″ Gotcha Series Switchback in a 6 lug version. 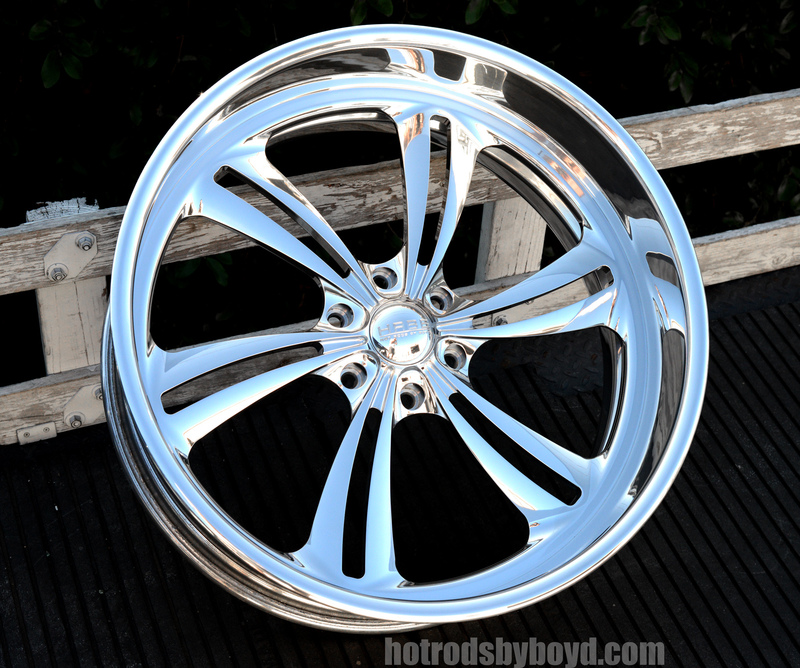 All the Gotcha Series wheels from Hot Rods by Boyd can be made to fit both 5 and 6 lug applications. They are lug specific so 5 lug wheels will have 5 spokes and 6 lug wheels will have 6 spokes. 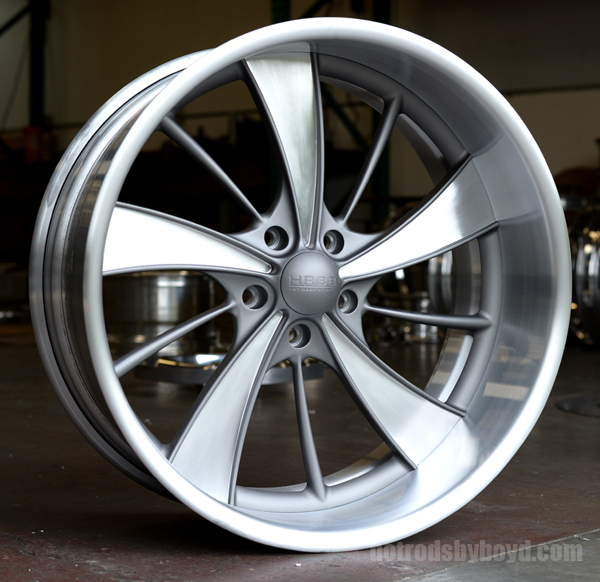 We build all the Gotcha Series wheels in 17″ through 24″ in a range of widths and offsets to fit most of your needs. The Switchback is shown here in full polished. 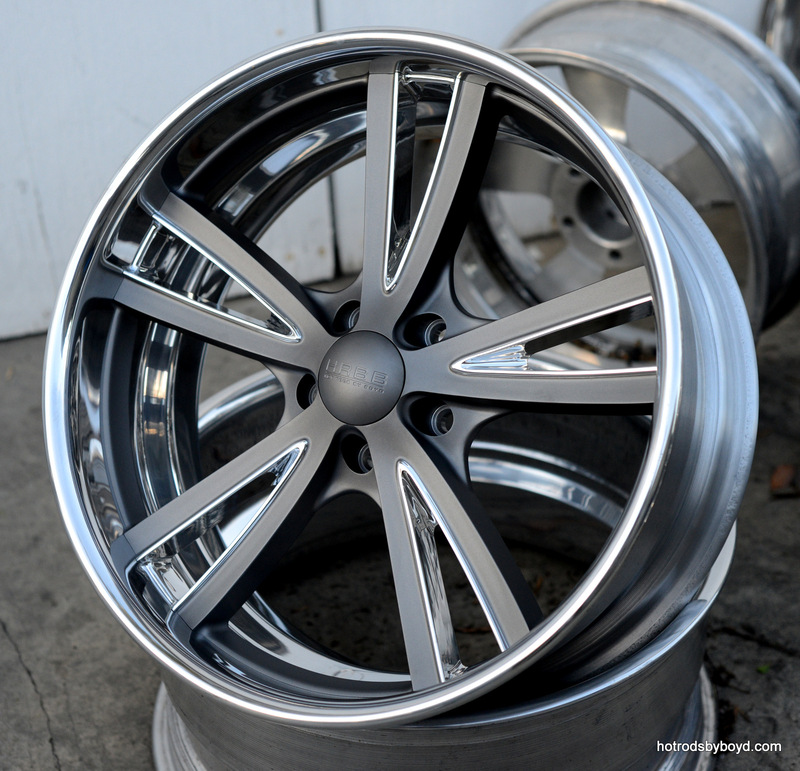 For more information on our Gotcha Series wheels please contact us at 714-855-4808 or email. 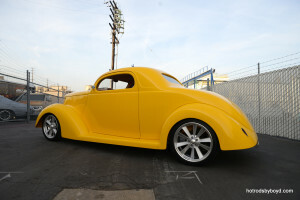 1937 Ford with Hot Rods by Boyd Perfected wheels. 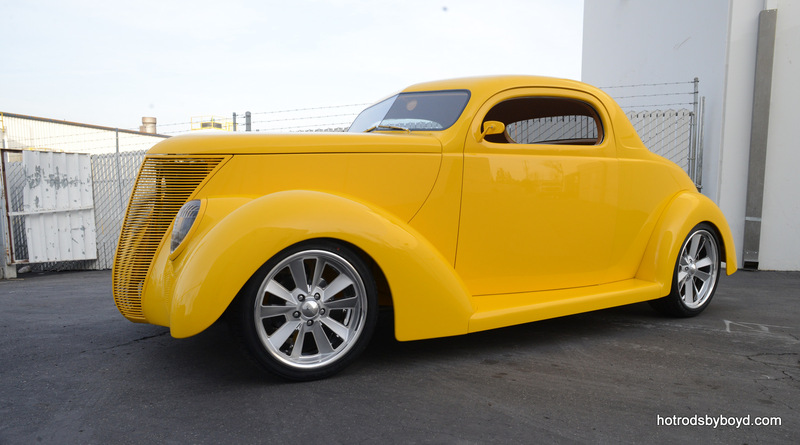 This 1937 Minotti body was originally built by Boyd Coddington in 1999. The car recently made a trip to visit Duane Mayer at American Hot Rods Inc for a little refresher. The first thing to get changed were to take off the dated billet wheels and replac them with some HRBB Signature Series Perfected. 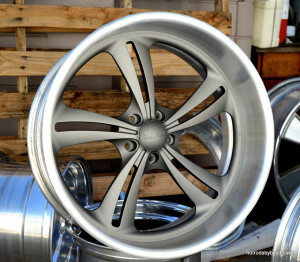 18×8 and 20×8.5 with HRBB’s famous polished and painted finish. The color of choice for the wheels were the ceramic silver. For more information about this build or the Perfected wheels call 714-855-4808. 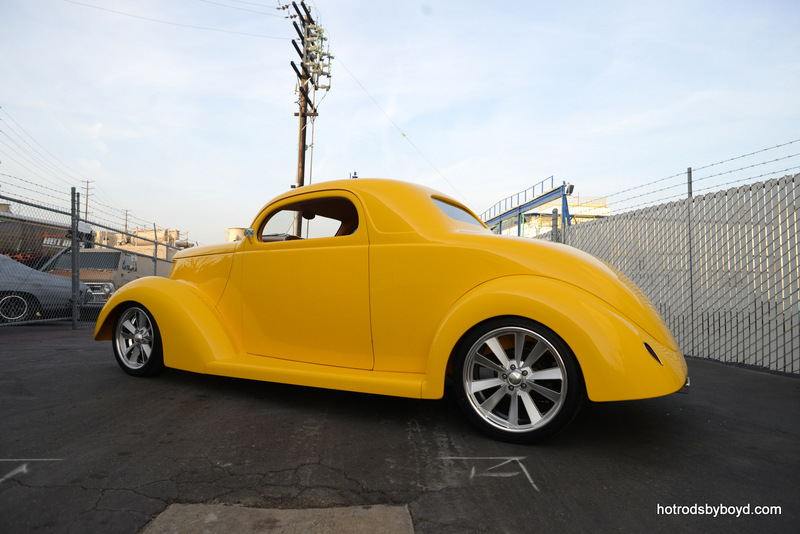 Permalink | Posted in Hot Rods by Boyd | Comments Off on 1937 Ford with Hot Rods by Boyd Perfected wheels. 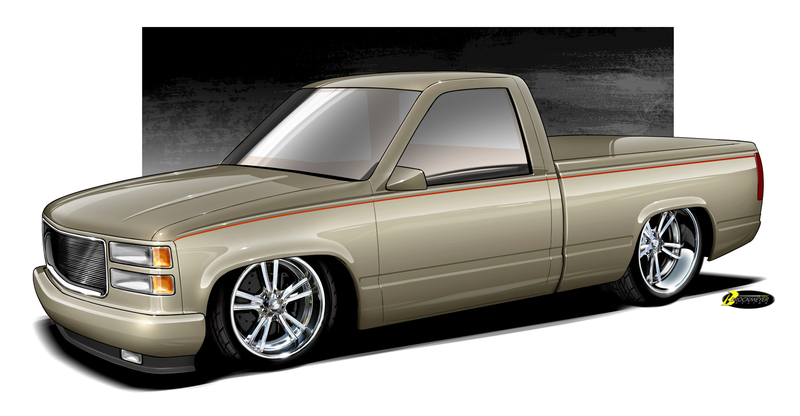 1997 GMC Sierra with 20 and 19″ Hot Rods by Boyd Amarillo wheels. The Amarillo is part of the HRBB Signature Series and is available to fit most 5 lug vehicles in a range of diameters from 17-22″. For more information on the Amarillo or the rest of the Hot Rods by Boyd give us a shout at 866-612-2693. The new Hot Rods by Boyd Gotcha Series Switchback. A true directional wheel shown here in 22″ with our ceramic charcoal finish on the center and a brushed outer. The Switchback comes in diameters 17-24″ in a range of widths. Like the rest of the HRBB Gotcha Series the Switchback is 100% made in the USA and made to order. For more information about the Switchback and other HRBB wheels feel free to contact us at 866-612-2693. The new LN-11 series from Chris Coddington and Hot Rods by Boyd. The LN-11 is shown here in 20″ with a combination charcoal painted center and brushed aluminum with low gloss clear applied. All Hot Rods by Boyd wheels are made in the USA and made to order. The LN-11 will fit most 5 lug applications and can be finished which ever way you’d like. From full polished to a combination finish like you see here. Right now HRBB is currently offering the LN-11 in 19 and 20″ diameters and is built to order in wide range of widths. The LN-11 will clear most big brake applications. If you have any questions about the LN-11 give us a call at 866-612-2693 or check us out at hotrodsbyboyd.com. Shown here is a painted and polished version of a Hot Rods by Boyd produced Signature Series Amarillo wheel. Shown in 20″ with a combination high luster polished with painted features. 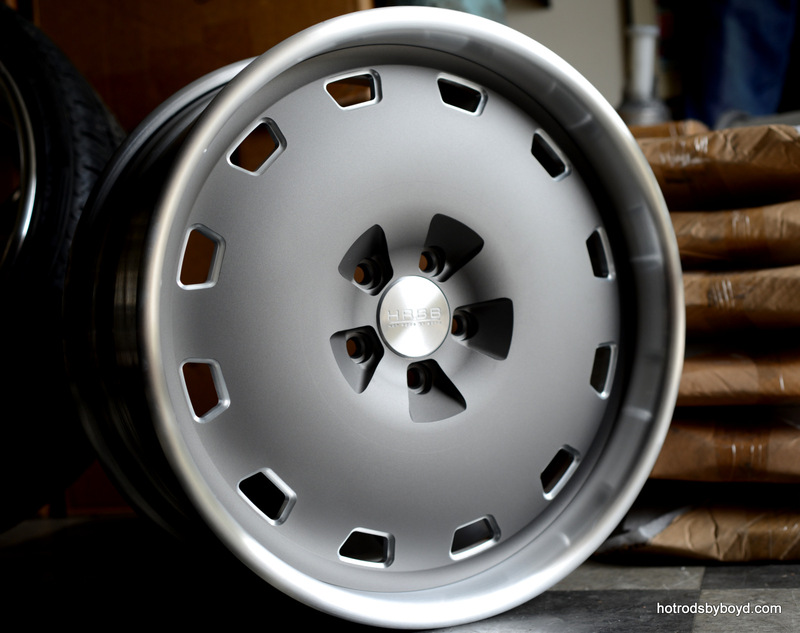 Like most HRBB Signature Series wheels the Amarillo is completely 3D machined out of a 6061 rotary forging. It is then polished up to a high luster, masked off, then painted with Coddington Coating Charcoal ceramic paint. The wheel is then assembled using a 6061 spun aluminum outer to the exact width and backspace required to dial in the correct fitment for you. This is just one version of how an Amarillo can be finished. To get more info on our finishes and our process give Hot Rods by Boyd a call at 866-612-2693.